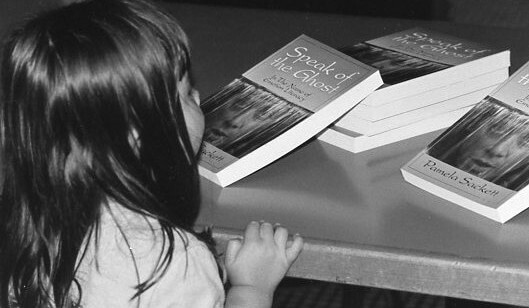 Speak of the Ghost: In the Name of Emotion Literacy is a series of seventy-eight finely detailed narrative poems and a comprehensive introduction. The book’s primary intent is to support individuals moving through family of origin issues by providing witness, prompts for stages of the journey, insight and encouragement. A work of creative non-fiction, the book also serves group facilitators working in therapeutic and educational settings. Hello Ms. Sackett…your name was entirely new to me…when I sampled some paragraphs from your book, I was quickly struck by the directness of expression, the clarity of detail and tone, the sense that you are reporting on real defeats, struggles and victories; the complementarity of inside and outside, of personal and social; the sharp challenges, the shocks of recognizing accustomed and perverted priorities; the both visceral and conceptual responses; the voices of self, selves, and self-alienation; the radical changes of recovery, the sweetness of healing and self-integration; and other content and characteristics I am still struggling to name. Most important, the conviction that they all are fruits of a hard-won knowledge and integrity. Such an integrity is part of my goal also. Take a look at Pamela’s book and you will find everyone on trial, caught and transformed. I loved those poems. Pamela’s words and feelings are mine. She went into that place in me where they had been hidden for so long and gave permission for them to finally come out. Her work is a gift to me because it gives so much permission and validation. This book is a primer for the reality of emotion, makes it tangible. Reaches the part of me that sees without my eyes—-my whole being—-every cell of my body has eyes when Pamela speaks. …tapped my losses from childhood forgotten, that men don’t talk about in our culture…tapped somewhere in me, untied a knot in me long buried. Her collection of poems and writings contain strong emotion, clear insight and models ways for each reader to emulate as we fight clear of the hurts of the past. Your words went directly to my emotional body. As I listened to you, I heard the truth of my own story, uttered with such passion and wit. My body literally tingled. I felt shivers as the wave of realization rippled through me. Thank you for putting words to my experiences. I feel more deeply empowered to utter my own story now. What an absolute pleasure. Your language drew me in, made me ponder. I thank you for that. Several of your pieces are meant for several of my clients, and me, and my husband! Having also been born into a family where emotional repression was the key to survival, I was quite moved by many of your pieces. I was also very heartened by the commonalty of experience and the hope, willingness and insistence on active change towards emotion literacy. As a researcher in domestic violence and as a survivor, I wholeheartedly recognize and acknowledge the need, and thank you for your courage. It helped me to re-establish the importance of my writing and among many other things, being a witness to children. Like every offspring, Speak of the Ghost came with its own set of gifts and demands. Mere minutes after an east coast truck delivered the finished book to my door, I received a call from Kevin Krycka, Seattle University’s (then) graduate psychology program director letting me know he elected to put the book on a required reading list and integrate my live, dramatic presentations into three psychology curricula. Placing such a personal work into such a public format heightened my sense of risk and fear of scrutiny, punctuating the essence of why I needed to write the book in the first place–to retrieve my own sense of authority and to exercise my ability to stand by it, no matter how this work might be publicly perceived. Engaging in that struggle through the writing and delivering of Ghost influenced my direction, personally, as an artist, forever, and seeded the founding of Emotion Literacy Advocates. I am grateful to all those who let me know they appreciate the chance I continue to take, years hence, with comparatively microscopic hesitation. Learn more about “Speak of the Ghost” here.